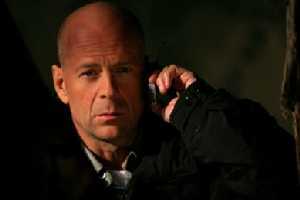 Cast: Bruce Willis, Kevin Pollak, Jimmy Bennett, Michelle Horn, Ben Foster, Jonathan Tucker. Marshall Allman. Directed by Florent Emilio Siri. Story: An ex-hostage negotiator finds himself thrust into a familiar situation. Bruce Willis has found himself a cosy little niche in the roles he plays. Ordinary bloke, possibly trained in something useful in a previous life, caught in an extraordinary situation - that's Brucie's bread and butter. He delivers pretty reliably in that role too. When he gets talented direction and a fairly interesting story, well that's just a Brucie bonus. Hostage concerns a trio of teenage delinquents who get in way over their heads when they hold a rich family hostage. Bruce Willis is the local cop and ex-negotiator in situations like these. Naturally, things get more complicated in ways I shan't ruin for you and Brucie gets his chance to be a hero again. Hostage could so easily have been derivative candy-floss toss but thanks to the quality of the people involved, it transcends mediocrity and holds its own nicely. Not that this is Citizen Kane - it's just a pleasingly captivating siege movie. At times the script can get a little corny, but it stops just this side of laughable. Mostly. There's a rather dubious bit towards the end where the director tries to make the baddie look like Jesus and the kidnappee look like Mary - I have no idea what to make of that. I assume it's a pretentious legacy from Siri's previous work in video games (Splinter Cell). Plotwise, Hostage is pretty comfortable - it can't have had much opposition on that score. Unusually, there's enough plot that they can even afford to have a seemingly significant plot detail that isn't followed up - if I say "2 DVDs", you'll know what I mean once you see it. The acting is not top notch - Bruce is fine in a Die Hard-esque way, Jonathan Tucker is impressive as the panicky hostage-taker, but Ben Foster takes things a little too far in the role of a lifetime, the crazed psychopath. Emotion is built up using dramatic music - again, just and only just short of comical. One misplaced glance or careless line and the balance could have been irrevocably tipped, yet somehow it teeters on the edge and succeeds in maintaining the suspense without making us sigh in resignation and check our watches. No mean feat. Hostage is harsh, dangerous and yet glossy at the same time. It will appeal to action fans as there is plenty of slo-mo gung-ho malarkey - but the psychological twists and unpredictability will keep the rest of you entertained as well. This is one of those rare movies that both boyfriend and girlfriend will enjoy - though the girlfriend will pretend not to so she can see Shall We Dance next time. Don't be fooled! Testosterone Satisfaction Rating: 3/5 Psychos, guns and heroes. To enjoy this film you should: suspend cynicism.